I did this in 2008 when I was about 21 years old. 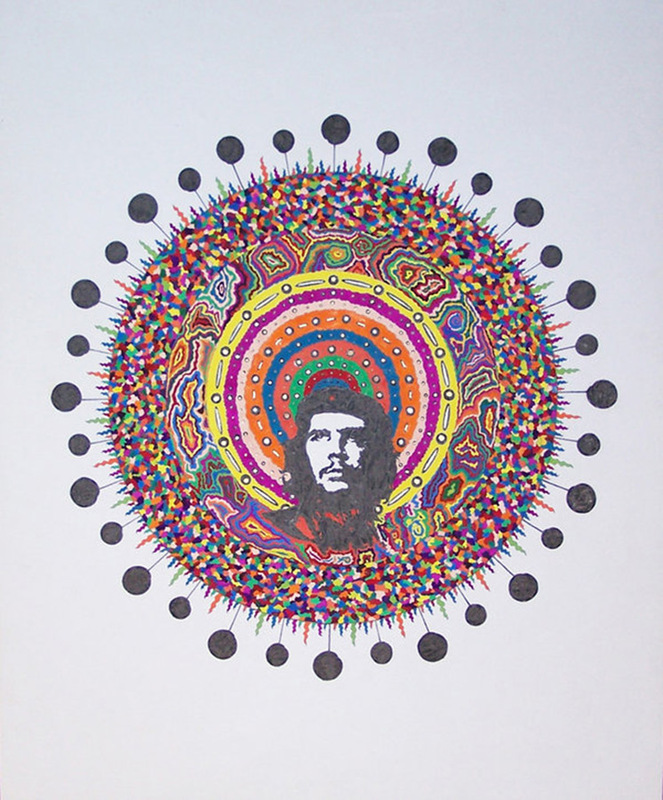 Before you judge this piece you have to know that it has absolutely nothing to do with Che Guevara, this work deals with the POP image of Che Guevara. I met some people who had this exact image on their shirts and when I asked them why they wear an image of Che Guevara they didn’t even know who I was talking about. This really saddened me seeing how people are completely Mind-Raped by pop images or the pop culture. It made me wonder about many things like who created this graphic image and exploited it out of proportion. I could have just as well put in the ugly Ed Hardy logo instead of the Che Guevara image that is half the size of the design on the t-shirt, and it makes me sad seeing people who I would think are above the exploitation but really they are just a bunch of brainless sheep following the popular trends such as Ed Hardy. If you don’t like what I’m saying here, well.. too bad. Unfortunately we live in a very superficial society. I have lived in LA almost my entire life and things always stay the same, like people judging other people just off a first glance by the shoes, shirt, hairstyle, someone wears and unfortunately it is a part of our ignorant human nature. When you look at this piece I want you as a viewer to question yourself, go look in the mirror and think about why you wear what you wear, why you do what you do, even the professional artists who view this I want you to question yourself why do you paint what you paint and under whose influence do you SUBMIT yourself to? And why? This work has to do with the hypnotizing effect of pop culture, how individuals get turned into sheep following popular trends and don’t even realize that they are completely exploited. I unfortunately can’t separate myself from pop culture because I am also a product of today’s world. In one of the fill-ins outside the yellow opening I have actually filled in one of them with my own blood, with a concept that even though I criticize today’s pop culture I realize that I am still a part of it. It is on the East of the painting, (if you find it) and Los Angeles is located on the West of the United States, with this I state that in my heart I feel distant from all of this superficiality and want to separate myself from it, yet regardless of anything I am still a product of it.